Welcome to the next stop on the Jolly Holly Blog Hop. If you are just joining in, you may wish to hop back to the beginning with Kristen’s blog so you can see the whole lineup. On to the project – a cookie cookbook using Cricut and Silhouette. I love combining these two die cutters together in projects as both are unique and offer different capabilities. Mrs. Claus is from Cricut’s “A Quilted Christmas”. Does anyone else find she bears a startling resemblance to Paula Deen? Mrs. Claus was cut at 4.5″ tall. Her stove is from “Country Life” and is cut at 3.5″ tall. Using the Cricut Craft Room, I extended the stove-pipe by welding a rectangle to the end of the stove-pipe. I hand trimmed off the coffee pot as I thought it didn’t suit the occasion as much. I added some Copic shadows to her apron and a little red crystal for a holly berry to her head band. Her kitchen sign is from a Just Rite Stamp set. I simply trimmed the paper and added a dark frame. I made the faux bois floor by drawing in the dark plank first and angling the lines out from the center point. I then added tans and brown with Copics and some wood grain with a Micron pen. 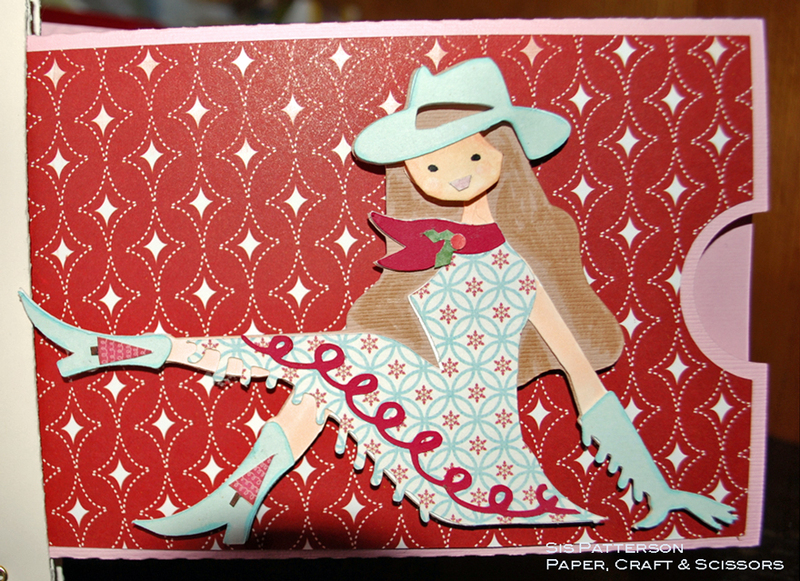 I used “Summer Celebration” for the Cowgirl and cut her at 4″ tall. I hand cut the Christmas tree accents for her boots from the “Be Merry” collection. Her patterned paper dress is also from “Be Merry”. I added some hand-cut holly leaves and a Crop-A-Dile berry to her scarf to make her a little more Christmas-like. 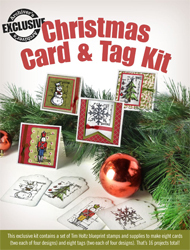 Tim Holtz Christmas Card and Tag Kit! I will be drawing on winner on Monday 12 November at 9:00 AM EST- so don’t forget to leave a comment. I will ship to North America, Australia, or Europe. Adorable project! Love all the detail! A wonderful mini Sis and it’s just perfect for holding recipes. I love each and every detail!! Well, where do I even start? You are fast becoming the Queen of Recipe Pages (and now Cookbooks too). Using Copics to shade her apron is so smart! Yes, now that you mention it, I can see Paula Deen! Love that she has a pot belly stove! I love all of the prints you used on Mrs. Claus– especially that curly-cue one for her hair! (And I love that cut– she has a sassiness to her that I love!) Great room-building with the wallpaper and wood flooring! Once again, you have found a file that makes me want a Silhouette! Love this cookbook design with the pockets! Your cowgirl is too much with her perfect Christmas accents! I love how you transformed her into a seasonal figure!! Brilliant! Always a treat to visit and see your projects. So inspiring and absolutely fun!! What a GREAT cookbook! All of your little details add up to amazing! Paula’s, oh Mrs. Claus, is perfect with that outfit and hair. The potbelly stove is the main reason I bought Country Life. And the other touches like the bells hanging with twine and that floor – I had no idea that you did that by hand when I first saw the photo! Love the ‘Keep Calm…” sign too. This is too cute! Yep I think she does kinda resemble Paula Dean. lol Very fitting for a cookbook. Great job on this. wow!!! This is a super great project! Thanks for the wonderful ideas… and sharing them with us! What a great cookbook! I have been wanting to make a christmas cookie-candy book! Your projects are always a treat to behold Sis! This is another fabulous creation. I love all the details you put into this! And….I recognize that paper! I have it and so far it’s only use was a little box Gina made at Mania! Guess I better get busy! The cookbook is so nice. I think this is a project I will have to try. Everything you create just blows me away! I love everything about this, the colors, all the wonderful detail! Simply amazing! Very cute! I will have to keep my eye on this project! Adorable”. Love Minis!!!! Nice job! Love the jingle bells on the twine! Wow, beautiful looking project. I’d love to have a cookbook like that. You did a nice job. Adorable cookie cookbook! You are right, Mrs. Claus does resemble Paula Deen. Adorable cookie cookbook! You are right, Mrs. Claus does resemble Paula Deen! Absolutely love this cookie cookbook. Love that Mrs. Claus is a Paula Deen look alike!!! OMG..this is absolutely amazing…you are genius….Mrs. Claus is wonderful! Wow! What an adorable cookbook. I love it! You did a wonderful job and I thank you for sharing! Wow – spectacular project! Love that stamped kitchen sign. Love your project! Gave me ideas for recipe books I’m making for Christmas presents! Thanks. This is fabulous — love all the details!! And, yes, Mrs Claus does bear a resemblance to Paula — love the kitchen sign and the jingle bells hanging from the twine!! This is a fantastic cookie book. I love all the details and your embellishments with your Copic markers. Whoever receives this cookbook will truly treasure it! Wow!!! what amazing detail on that cookbook project! It’s so cool! Well, geez, no wonder you “ran out of time” to get the whole book finished…look at all these great details!!!!! And I’m a detail kind of gal so I think the result is most definitely worth all the extra work, blood, sweat & tears that YOU put into it (easy for me to say, huh??!)!! Yep, that will forever be Paula Deen from now on (naughty Santa Claus!)! I love, love, love her stove & the sign hanging in her kitchen…you probably get the idea…I LOVE it!!! What a super fun idea! How creative can you get! What a unique and creative album! I love the Mrs Claus and the cowgirl! I love, love, love the jingle bells hanging from the twine! SIs this is so adorable. Love the cowgirl -she’s adorable too. Yes I agree totally this looks like Paula Deen. Great job. Thanks for sharing. Totally love this project and your comment about Paula Deen just made me giggle! Awesome! Love it, thank you! Fantastic project. 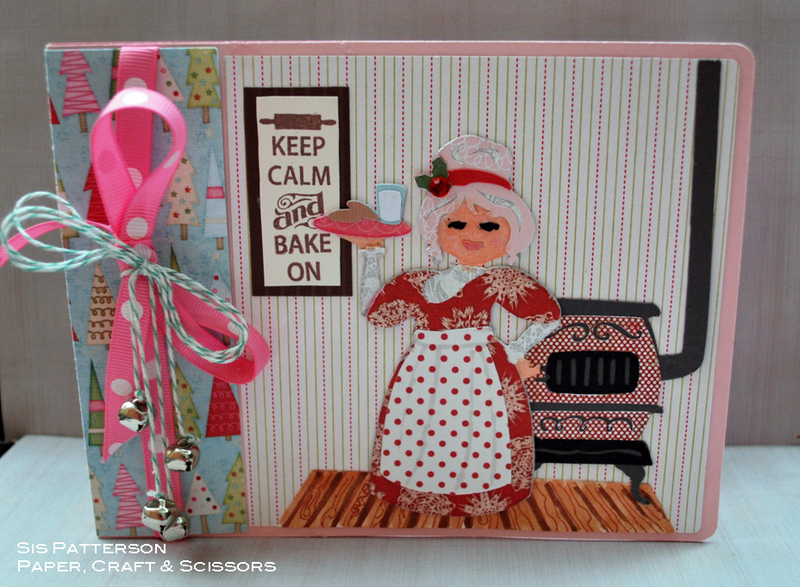 The idea of a recipe tag book is one I will have to remember, I love fun cookbooks! Love the book, love the papers, love die cuts. Fantastic job. Love, love, love this! So many details, it’s just gorgeous. And, yes, Mrs. Claus does look like Paula Deen. Thanks for making me smile! Updated pics are adorable too! Totally looks like Paulla!!! What wonderful work. I just love it! You are soooo right! That looks just like Paula!! Your cookbook is gorgeous! Love the cowgal, too! I just love your project, and your site. So glad I decided to follow along with this hop. I will definatly be coming back. Thanks for sharing your talent with all of us. Another fabulous project! Totally see Paula Deen lol. Love the jingle bells :D.